This site is dedicated to the music and life of Lou Stein, jazz pianist. This is the official source of information on Mr. Stein. He played with many great jazz musicians including Charlie Parker, Dizzy Gillespie, Milt Hinton, and Charlie Ventura to name a few. He recorded scores of albums and CD’s over his career and wrote music for radio and television. He also was a master teacher and wrote several jazz music books. We are pleased to honor his memory and musical legacy with this site. Lou Stein grew up in Philadelphia and acquired thorough classical training under Gregory Ashman, accompanist to Ephraim Zimbalist. As early as eighteen he worked as a jazz pianist on the road and in his native town including a stint with Ray McKinley’s band. While in the U.S. Army, Lou was a pianist with the world-famous, Glenn Miller orchestra, alternating with Mel Powell. He toured Australia and Europe with the World’s Greatest Jazz Band (Lawson-Haggart Band) and Europe with the Savoy 7 including Curtis Fuller, Bob Haggart, Oliver Jackson and others. He has also toured Japan with Butch Miles and Peanuts Hucko. Lou played solo piano at Toronto’s well-known club, the Cafe Des Copains, and The Lou Stein Trio performed at clubs in NY and CT and featured Brian Torff, Jeff Fuller, and Bob Haray, as well as guest soloists. Lou Stein was a guest soloist at festivals in Odessa (TX), Vail and Aspen (CO), Monterey (CA), Fairfield (CT), at the Heritage Jazz Festival in New Orleans, and in New York at the Newport Jazz Festival. In the fifties, he became a much sought after free-lance artist in New York City and was voted second only to his friend Mel Powell as best pianist in the country by the readers of Downbeat magazine. He was the pianist who appeared on historic cuts, “Stella by Starlight” and “Lover” recorded by master saxophonist, Charlie Parker. These are featured on the “Charlie Parker with Strings” album. Lou was on the advisory board and a regular contributor to Sheet Music Magazine and Jazz and Keyboard Workshop. Oscar Peterson recorded another of Lou’s compositions, “Soft Sands” on Verve. 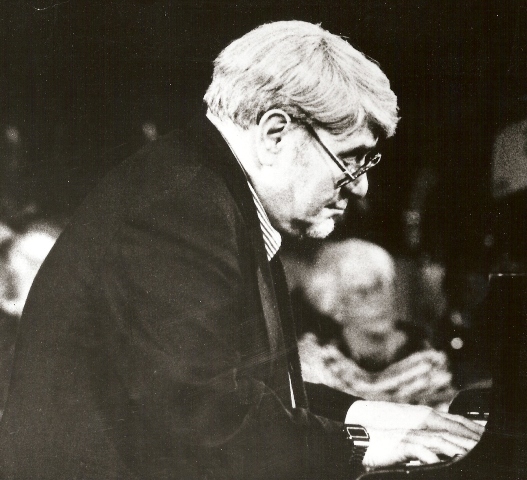 In addition to his career as a player and composer, Lou taught jazz history and piano at Manhattanville College and the State University of New York, hosted a weekly jazz radio show, and taught a small cadre of students. Lou worked and recorded with Percy Faith, Jackie Gleason, Bobby Hackett, Benny Goodman, Lester Young, Clark Terry, Kai Winding, Coleman Hawkins, Milt Hinton, Shelly Manne, Charlie Shavers and many others. Also during this time he recorded nearly fifteen albums on Decca with the Lawson-Haggart band featuring Lou McGarrity, Cutty Cutshall, and Bud Freeman. Lou appeared at the White House with the N.Y. Repertory Company for former President Carter and Chancellor Schmidt of West Germany in a tribute to Louis Armstrong. Lou was an integral member of the Charlie Ventura group as both player and composer. During the period with Ventura, Stein composed, “East of Suez,” one of the earliest jazz pieces to break with sonata form (A-A-B-A) that has since been recorded by jazz singers Jackie & Roy (nominated for an Grammy on Concord), pop vocalist Chaka Khan (Warner Bros.), and Canadian jazz flutist, Moe Koffman (Duke Street).